Anadarko Petroleum Corp. has the script down at this point. 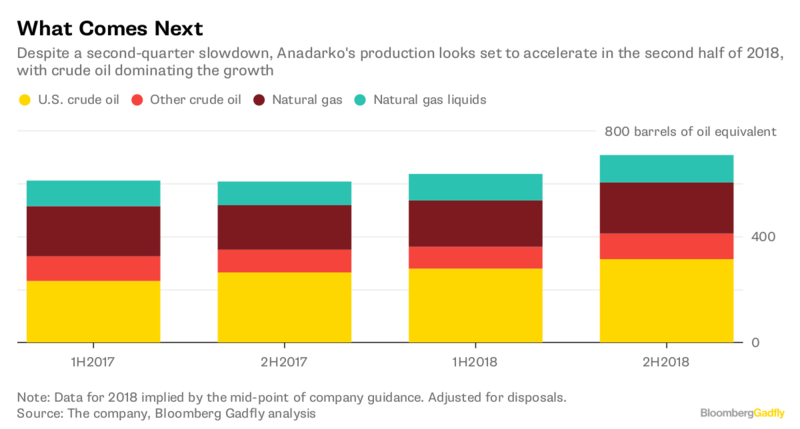 First-quarter results, announced late Tuesday, continued the theme, with Anadarko beating forecasts for earnings and production. The buyback, raised to $3 billion, is now due to be completed by the end of June. 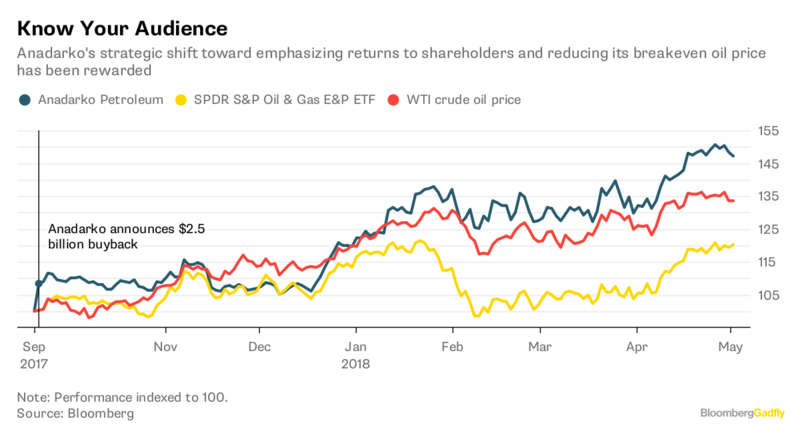 And on Wednesday’s call, CEO Al Walker kept repeating the message that the extra income from $70-ish oil prices would mostly find its way to shareholders rather than tempting Anadarko back to the usual E&P frack-fest. Investors just weren’t feeling it quite as much on Wednesday, though. Maybe it was a case of selling the news after buying all that rumor. Maybe it was the relatively soft guidance for second-quarter production. Maybe everyone was hoping for another concrete buyback announcement. Whatever it was, it misses the point. On valuation, Anadarko’s stock has obviously run up a lot. But at 6.7 times forecast 2018 Ebitda, it is hardly demanding and, indeed, is only about one turn above where it was prior to the change in strategy. That growth is one reason why Walker hinted on Wednesday’s call, with all the subtlety of an oil gusher, that more buybacks are likely later this year. Another is that capital expenditure should start to ease up soon. While the $100 million increase in the full-year capex budget is bound to raise concerns about discipline slipping, that is less than 2.5 percent. More importantly, the guidance implies a big drop-off in the second half, of around 40 percent, versus the first. This is important on two levels. First, some of that spending will be on Anadarko’s in-house construction of logistical capacity to get oil and gas out of its Permian-basin assets. As I wrote here, securing access to market is critical over the next 12 months, as the Permian’s surging production has run into pipeline constraints, forcing some operators to sell their output at a discount. Anadarko’s investment, as well as its efforts to secure space on existing and future pipelines, is sound planning to protect margins. Above all, it means Anadarko has options, something it appeared to lack this time last year. That alone should please the crowd.